Solidarity organizations in Europe are committed to building a more socially just society through a better configuration of democracy, politics and economy. 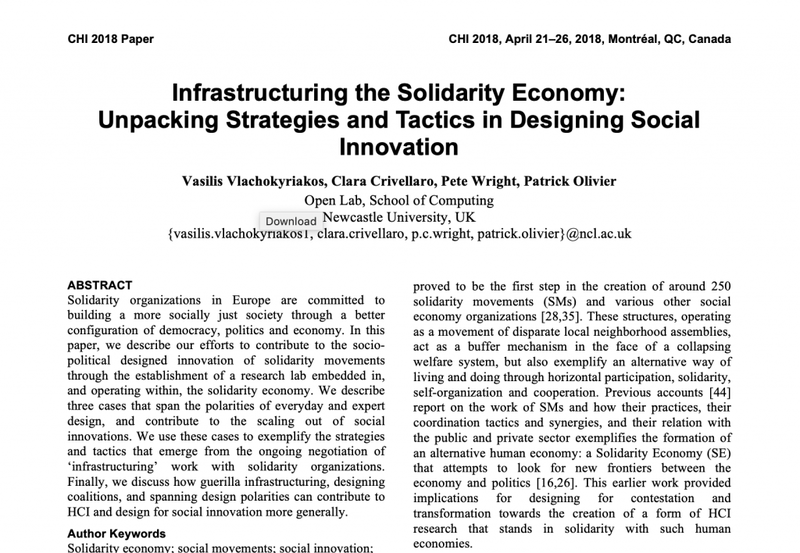 In this paper, we describe our efforts to contribute to the socio- political designed innovation of solidarity movements through the establishment of a research lab embedded in, and operating within, the solidarity economy. We describe three cases that span the polarities of everyday and expert design, and contribute to the scaling out of social innovations. We use these cases to exemplify the strategies and tactics that emerge from the ongoing negotiation of ‘infrastructuring’ work with solidarity organizations. Finally, we discuss how guerilla infrastructuring, designing coalitions, and spanning design polarities can contribute to HCI and design for social innovation more generally.